I will not claim that the artists of the Metaphysical school are my favourite painters. But I do find some of their canvases – think along the lines of Surrealism – highly impressive. 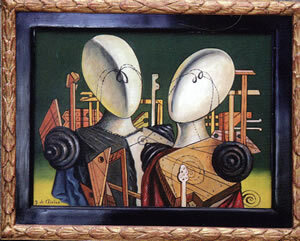 Chief among their number was Giorgio de Chirico. I was startled to find one of his works (pictured) in the entrance hall of the Capri Palace Hotel. Of course, I should not have been surprised, because his art is civilized and sophisticated and the Capri Palace is a civilized and sophisticated hotel. Appropriately, it offers a supremely civilized and sophisticated place for lunch – Il Riccio Beach Club (pictured), overlooking the sea. 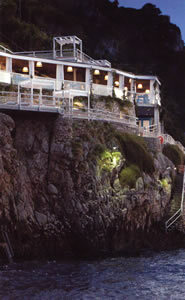 But I had come to the Capri Palace for dinner. Anacapri means ‘above Capri’, in Greek. This little town is, indeed, perched near to the top of the island’s cliffs. It is not right at the top. To achieve the very summit you must clamber onto a chair lift and sway heavenwards for a few minutes – something which I, for one, am not prepared to do. 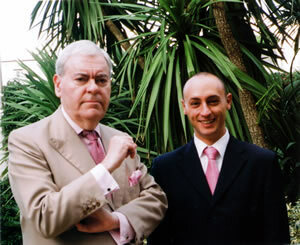 (I have been a close friend of Mr Vertigo for many years.) Still, I like the town. From it the views are so beautiful that they must surely enhance the lives of all those who gaze upon them. They are enjoyed by the many visitors and by those few who are fortunate enough to occupy its crumbling (but very grand) villas. 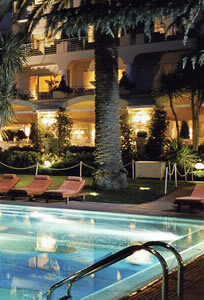 And, from 1960, they have been available to the guests of the Capri Palace Hotel. But my quest was not for the views, but for the food in its dining room. 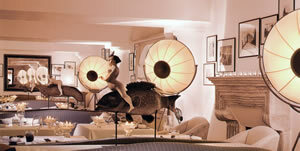 For L’Olivo, with its one Michelin star, is regarded as the finest restaurant on the Isle of Capri. 1960 cannot be regarded as the greatest year in the history of European architecture, so it is a relief that the hotel exterior – low and white – is not at all displeasing. The interior, however, is in a different league. Its combination of columns, arches, stone floors and vaulted ceilings imparts the feeling of a spacious and well-funded art gallery. (The de Chirico does not seem at all out of place.) And the furnishings reinforce the impression, with antique gilt candlesticks, contemporary sculptures and paintings and huge lamps of the sort used on film sets. This air of sophistication is continued in the white and grey dining room, designed by Loro Piana. 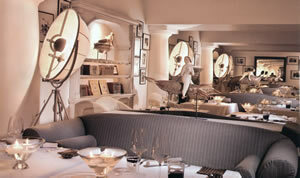 Here I found cashmere, cotton and soft wool, and walls hung with black and white photographs of Capri in the 1950s. Lit by a multitude of candles, this is very definitely a place for sartorial elegance. I thought my crocodile shoes, Savile Row suit and starched collar fitted in very well indeed. Here one expects to be cosseted, and the expectation is fulfilled. The napery is white, the cutlery is by Sambonet, the water glasses are of Murano glass by Moretti and the wine glasses are by Zafferano. I found the service, under the direction of two fine gentlemen – Restaurant Manager Fabio Raucci and Maitre d’ Luca de Coro (pictured) – exemplary, being both courteous, friendly and efficient. I liked particularly the ritual by the table of preparing small slices of bread, buttering them and then topping them with greenery, anchovies and salmon – to form delicious pre-dinner nibbles. Of course, napkins were replaced. The attention to detail extends, as it should, to the mineral water, and the list details 19 offerings. 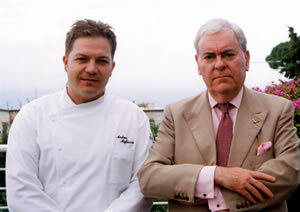 The cuisine of Chef Andrea Migliaccio (pictured) is in harmony with these delightful surroundings. Each of my dishes was an aesthetic as well as a gastronomic statement. This food is subtle and effective. I chose four courses from the carte (for 136€). There are also two tasting menus, with one of seven courses for 180€. I began with assorted vegetables and orange sauce. In its red dish, this was a painterly arrangement of which de Chirico himself would have been proud. In my mouth the sweetness of the sauce contrasted well with the asperity of the vegetables. Bucatini pasta with rabbit ragout was of the al dente sort, and was served in a substantial portion. Braised veal leg came with artichokes and lemon-scented puréed potatoes. I concluded with a citrus fruit meringue with white chocolate sauce and ginger and orange sorbet. Sommelier Angelo di Constanzo – a knowledgeable and affable fellow – oversees a vast wine list, with about 900 offerings. It has a feature new to me: a picture, in miniature, of the label of each wine offered. Prices begin at 20 euros, for a Tuscan white, and end with 1,100€ for Mr Gaja’s 1998 Nebbiolo Sorì San Lorenzo, and 1,200€ for 2004 Lafite. Most of the wines are Italian, but there are some tempting bottles from the rest of the world. From France I noticed 2006 Lynch Bages for 210€. From California there is 1997 Opus One for 560€. Of Italy’s best, the following caught my eye: 1999 Solaia (280€), 2006 Sassicaia (275€) and 2007 Planeta syrah (60€). A proper test of any list is to try the cheapest wines, for no poor wines should be on a good list, no matter what their price. This cellar passed the test admirably. My chardonnay from Abruzzo (Colline Pescaresi, Bosco Nestore - 25€) was creamy and well-structured, and my aglianico from Basilicata (Paternoster, 1999 - 20€), although it had lost most of its fruit, was still possessed of a distinguished and venerable nose. With this drink inside me, my exit from the hotel seemed slightly dream-like, for I walked down a slope and through a tunnel with the glass wall of a swimming pool on one side. I thought for a moment that I was in a painting – perhaps one of de Chirico’s Metaphysical paintings. And that would have been entirely appropriate for this civilized and sophisticated place. Capri Palace Hotel, via Capodimonte 2, 80071 Anacapri, Capri, Italy.